Virtual Reality and Augmented Reality. What’s the Difference? Part 3 of 3 – ACC Interactive Media Arts Student Blog! Welcome back friends! This is the last of our 3 part series. In the vibrant finale we will be covering Augmented Reality. The facts are real, but the beauty is merely an overlay. So what is it? Augmented Reality at its core is a visual overlay imposed on our real world. It can be used for a wide array of things: creativity, shopping, entertainment, or advertisement. Imagine being able to draw in 3 dimensional space. Making a statue out of nothing that stands 100 meters in the air. Apps like SketchAR are making that a very real thing. Giving the user the ability to create their own (and modify other peoples) creations in the world. 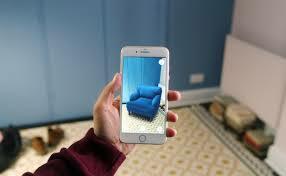 Ikea and a start up called Vyking are leading the way currently in AR by letting customers “view” products in their home before purchasing. You simply download the app onto your phone, pick your item, and use your camera to view the space you want it in. It will automatically adjust the items size and perspective to fit along walls and between the floor and ceiling. Vyking does the same thing, but overlays sneakers onto your feet. The most exciting development for me is how AR will influence entertainment. My imagination instantly make me think of the movie “Sword Art Online: Ordinal Scale”. The idea being that you BECOME your avatar. Other people will see you in the outfit you want to wear and landmarks become fantastical fantasy landscapes. Imagine seeing Big Ben in England looking like a creepy, decrepit, falling apart tower. With AR its entirely possible. Companies like Google, Apple, and Facebook are embracing the AR wave. Jumping in on the development of this technology so they can have a larger piece of the pie when it becomes common technology. The way I see it being manipulated is you’ll be walking down the street and have ads overlay non critical space. One way it could work is advertisers could pay for a persons view-able space. The more you spend, the more space you’re given and the more people see your product. Thanks for joining me on the journey of information and discovery! Some of what we talked about may just be fantasy, the workings of an imaginative mind. But perhaps it’s not. The future of AR and VR is anything but certain and I for one am eager to see it develop. This entry was posted in Interactive Technologies, Media Trends & Tech. I found this blog to be a very informative affair, it didn’t skimp on information and had linked sources to be read about and it was a very well read piece of work. No bad grammar or grammatical errors to speak of, it had well read information which let me very clearly understand the information. I feel that VR and AR is an underappreciated technology and this blog definitely addresses that fact with facts and information showing that while the usage is quiet its there and in force and can only be expanded upon.